My Fashionable Designs: Nail Art Pens! Wow, I love these fun nail art pens that my teenage neighbor brought over the other day!! They have the tiniest little tip for creating intricate details on your nails! I am artistically challenged, but I was able to create this zebra-print design on my nails in a couple of minutes!!! 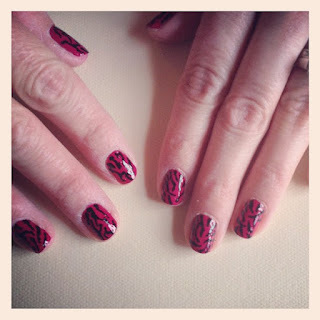 I used the quick-dry polish as a base coat (Sally Hansen), then free-handed the zebra lines. I immediately had to purchase a set of these nail art pens!